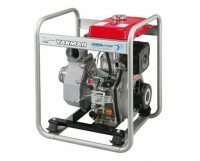 These long-running, fuel-thrifty Yanmar units range in bore size from 2 to 4” for fresh water and gravel/trash models. Fuel-efficient diesel pumps can be operated 1.5 to 4 times longer than gasoline pumps. This advantage shows at night and during continuous pumping operation at sites where no commercial power is available. Compact design and light weight allows for easy cleaning and maintenance. Fresh water models are designed for agriculture and home. Semi-trash and trash pumps are suited for agriculture, home, civil engineering, fishing, and rental. Available December 2016: Factory-produced YDP20-40 series. Make life easier with these electric start models; battery included.